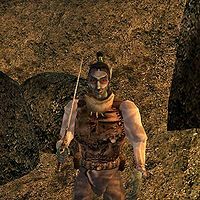 Belas Othren is a hostile Dunmer agent located in Nund. He is a medium trainer in Short Blade, Light Armor, and Sneak, if you can manage to speak to him. Belas wears a netch leather cuirass with a common shirt, pants, and shoes. He wields a leveled enchanted short blade and carries two leveled lockpicks and a leveled probe. Aside from his natural resistance to fire and the sanctuary provided by his ancestors, he knows no spells. This page was last modified on 8 August 2014, at 13:56.